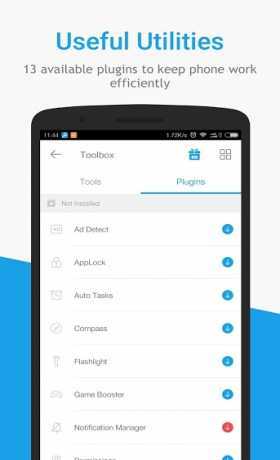 Free Download All-In-One Toolbox Pro APK for android from revdl.com. The best Android cleaner All-In-One Toolbox, equipped with more than 29 Android system tools, is designed to clean up various junk files, unclog storage, boost memory, protect your private data and keep your android device smooth and flexible. Comprehensive and powerful features make the All-In-One Toolbox the most reliable system tool app on Android device and actually, it is one of the best Android cleaner available in the market for free! ★ Thorough:　Providing thorough checkup to find out all the junk files hidden in every corner and clean them out without any risk or harm to your devices. ★ Multilingual supported: 28 languages available to serve Android users around the world. ★ Light weighted: Plenty of tools and powerful cleaning services are compacted into only 4.6 MB!It will be the most reliable cleaner and memory booster for your Android smart phone and tablet.What All-In-One Toolbox can do for you?